For other people with the same name, see Thomas Godwin (disambiguation). Tom Godwin (June 6, 1915 – August 31, 1980) was an American science fiction author. Godwin published three novels and twenty seven short stories. His hard SF short story "The Cold Equations" is a notable example of the mid-1950s science fiction genre. "The Cold Equations" is a science fiction short story by American writer Tom Godwin, first published in Astounding Magazine in 1954. 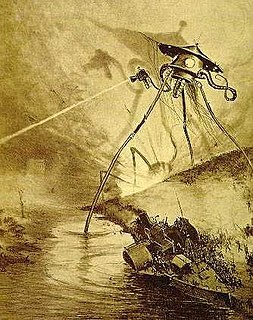 In 1970, the Science Fiction Writers of America selected it as one of the best science-fiction short stories published before 1965, and it was therefore included in The Science Fiction Hall of Fame, Volume One, 1929–1964. The story has been widely anthologized and dramatized. The Survivors is a science fiction novel by American writer Tom Godwin. It was published in 1958 by Gnome Press in an edition of 5,000 copies, of which 1,084 were never bound. The novel was published in paperback by Pyramid Books in 1960 under the title Space Prison. The novel is an expansion of Godwin's story "Too Soon to Die" which first appeared in the magazine Venture. If was an American science-fiction magazine launched in March 1952 by Quinn Publications, owned by James L. Quinn. Eric Flint is an American author, editor, and e-publisher. The majority of his main works are alternate history science fiction, but he also writes humorous fantasy adventures. His works have been listed on the New York Times, Wall Street Journal, Washington Post, and Locus Magazine best seller lists. Katherine Anne MacLean is an American science fiction author best known for her short fiction of the 1950s which examined the impact of technological advances on individuals and society. Mark Phillips was the joint pseudonym used by science fiction writers Laurence Mark Janifer and Randall Philip Garrett in the early 1960s. Together they authored several humorous short novels in the so-called "Psi-Power" series: Brain Twister (1962), The Impossibles (1963), and Supermind (1963). For Brain Twister they were nominated for the Hugo Award for Best Novel in 1960. They also co-authored the novel Pagan Passions (1959) with Garrett using his own name and Janifer using his Larry M. Harris pseudonym. John Joseph McGuire was an American author of science fiction. Immodest Proposals is a collection of 33 science fiction stories by British-American writer William Tenn, the first of two volumes presenting Tenn's complete body of science fiction writings. It features an introduction by Connie Willis. Tenn provides afterwords to each story, describing how they came to be written. The Priests of Psi (1980) is a collection of five short stories written by science fiction author Frank Herbert. All of the works had been previously published in magazine or book form. The Best of Frank Herbert (1975) is a collection of thirteen short stories by American science fiction author Frank Herbert and edited by Angus Wells. In 1976 this book was re-released as a two volume set; The Best of Frank Herbert 1952–1964 and The Best of Frank Herbert 1965–1970. All of the stories in this collection had been previously published in magazine or book form. The Book of Frank Herbert (1973) is a collection of ten short stories written by science fiction author Frank Herbert. The first edition of this book contained cover art and interior artwork by Jack Gaughan. Three of the stories in this collection appeared here for the first time. This is a list of works by the science fiction author Frank Herbert. 'Pauline Whitby was British science fiction author who wrote under the pseudonym Pauline Ashwell (1928 - 23 November 2015. She has also written under the names Paul Ashwell and Paul Ash. The Best of Poul Anderson is a collection of writings by American science fiction and fantasy author Poul Anderson, first published in paperback by Pocket Books in August 1976. It was reprinted in August 1979. The pieces were originally published between 1953 and 1970 in the magazines Astounding Science Fiction, Analog, Galaxy Magazine, and The Magazine of Fantasy and Science Fiction, and the anthology The Farthest Reaches. The Adventures of Doctor Eszterhazy is a collection of historical mystery fantasy short stories by Avram Davidson featuring his scholarly detective character Doctor Eszterhazy and set in an imaginary European country. It was first published in hardcover by Owlswick Press in January 1991, with an ebook edition issued by Gateway/Orion in August 2013. The book is an expansion of the earlier collection The Enquiries of Doctor Eszterhazy (1975), adding six more Eszterhazy stories written later but set earlier.